If you would like to commission me, whatever the subject, as I do like a challenge! - please do get in touch, either by e-mail or phone. I would be grateful for any constructive comments about this web-site. The picture above is of David Shepherd painting, and Jonathon Truss and I looking on, at the Governor's Camp, Masai Mara, Kenya. The one on the right is me on my home-made donkey easle, Skibo castle. 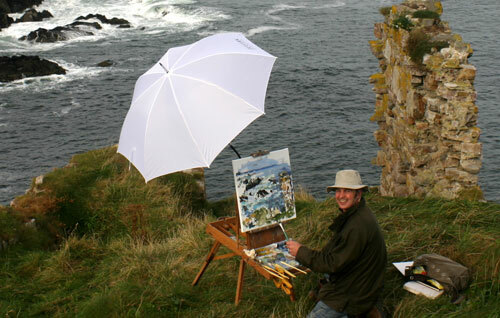 A windy day painting, Findlater Castle. Thank you to the hikers! from the Perth-shire area, who took this photo of me.